In most cases of corneal dystrophy and degeneration there are changes in the transparency of the cornea caused by the formation of anomalous material deposits. 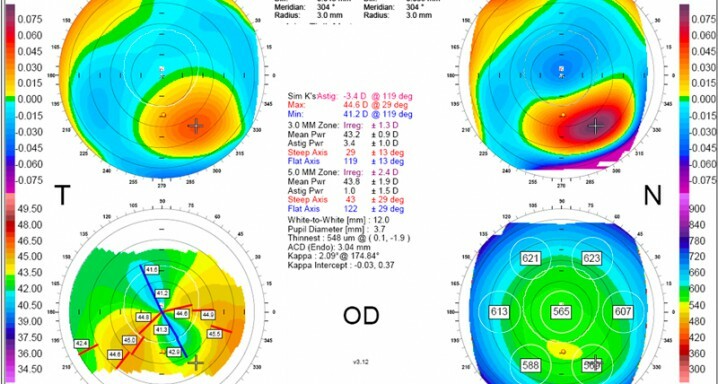 In some cases, when the shape and thickness of the cornea is more affected, ectasia results, such as keratoconus. Incidence is low in general but there are exceptions, such as epithelial basement membrane dystrophy and corneal guttata (Fuchs' dystrophy), and its recurrence is highly variable: from being totally unnoticeable or a mere curiosity to causing severe loss of vision and a suitable case for corneal transplant. The human cornea is the first lens in the eye's optical system. It is tissue measuring around 550 microns and made up of five layers. The last layer of the cornea is the endothelium, made up of a single layer of hexagonal cells that have almost no regeneration capacity. Endothelial cells are responsible for keeping the cornea transparent. Fuchs' dystrophy is one of the main diseases affecting the endothelial layer of the cornea. In this illness, degenerative changes appear in the endothelial cells that result in premature ageing and a deterioration in their function which, in advanced stages, lead the cornea to thicken, swell and become less transparent, especially early in the morning. If vision is severely compromised, the only solution is a corneal transplant, which is currently carried out selectively via a posterior lamellar transplant or Decemet membrane endothelial keratoplasty (DMEK), in which the healthy endothelium is transplanted so that the newly transplanted endothelial cells restore transparency to the cornea and therefore recover the patient's good sight.